The Richland Thunderduck men’s basketball team held off a challenge from Eastfield as competition in the Metro Atlantic Conference (MAC) got underway last week. The T-Ducks are in the hunt for the top spot. “This will be a good challenge for us,” Richland assistant coach Brian Graham said. Eastfield’s Rashaun Coleman is the conference-leading scorer at 21 points per game. Combining a talented roster with high-flying scorers, Eastfield’s basketball team is averaging a league high 104 points per game. David Shepard attempts a dunk against Eastfield on Jan. 23. As tip-off began, the game looked like it would be a struggle until the final buzzer. Richland and Eastfield exchanged mid-range jumpers and three-point shots. Once Eastfield shot the go-ahead jumper to make the score 20-19, then the tide turned in favor of the Thunderducks. The defensive intensity left Eastfield helpless and the T-Ducks went on a 14-1 run. At that point, Richland was the dominant force. The T-Ducks finished the half leading 42-33. The difference came from Richland controlling the paint. Richland’s starting center Ahmad Caldwell and reserve center Quintin Wallace were forces to be reckoned with. The center duo contested every Eastfield inside attempt with a hands-up defensive effort. They had great position advantage against any possible rebounders with a wide box-out range and, overall, controlled the paint as the designated rim protectors. That control led to good fortune for the T-Ducks. Caleb Williams, from the guard position, was able to grab numerous rebounds and finisher David Shepard was able to pull off acrobatic layups. Francis Doe shields the ball from an Eastfield player during a win over the Harvesters. As the game dwindled to a close, the Thunderducks started to lose focus. Richland was leading by a game high 15 points, yet Eastfield would not go away. The defensive intensity that propelled Richland into a dominant force had simmered down. Combined with a couple of costly turnovers and a few lapses on defense, Richland held on to a 77-73 lead with 41.9 seconds to go. 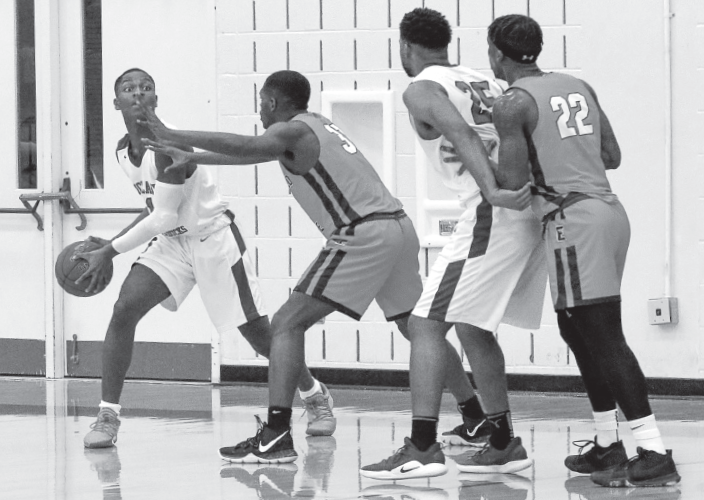 Eastfield’s Coleman attempted to close the gap on a drive to the basket, but lock-down defender Javon Modester stripped the ball and regained possession for Richland, ultimately leading to intentional fouls by Eastfield. With the 82-74 win, the T-Ducks have sole possession of 2nd place in the MAC. At 3-1 Richland is one game behind Mountain View. Richland was scheduled at press time to take its two-game win streak to North Lake on Jan. 26. As noted by coaches and players alike, the T-Ducks will have to clean up their play coming down the stretch, but have plenty of roster talent and leadership to do so.